The ever-present flower on my desk sits in a skinny vase that doesn't exactly scream I'm-kinda-geeky-but-hey-it's-ok-because-I-make-cool-things. 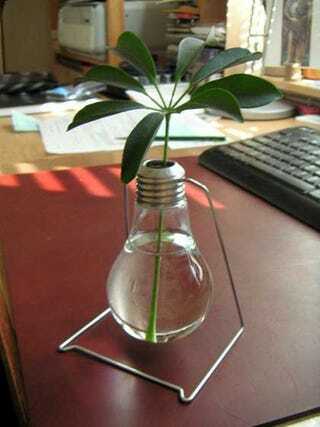 Time to start using a funky DIY planter or mini terrarium made of repurposed light bulbs. Maybe the what-a-bright-idea puns will be a bonus. Check out the Instructables guide for details on how to hollow out light bulbs and build the necessary stands without cutting up your hands. There are even some bonus light bulb projects on there.